Joseph Eichler (1900-1974), was an American real estate developer well known for his suburban developments in what has come to be known as the California Modern, or mid-century modern style. His most extensive development was in the San Mateo Highlands. It was built over an 11-year period from 1955 to 1965. To promote this new development, Eichler built the X-100. It was a research house designed in 1955 by architects A. Quincy Jones and Frederick E. Emmons and opened in October 1956. The plan is roughly a square that has been split and slid along the north-south axis. Sliding the plan created the openings for the entries, and—in conjunction with all the glass—dissolves the distinction between interior and exterior space. The materials are steel (structural and decking), and concrete (block and slab). The interior is finished in panelling, laminate and ceramic and vinyl tile. Lighting is provided principally with skylights, which are spotlit from above so they can be a source of light both night and day. This is supplemented with wall and ceiling mounted spot lights, and the occasional pendant or ceiling fixture. The central bathrooms are tiled on the floors, walls, and counters, and feature a shared sunken shower. The kitchen is open and modern, with the only nod to tradition being the oven cabinet that separates the kitchen from the living room. For the curious, below is a Universal International newsreel from October 24, 1956 that introduced the house. The announcer points out that "it's not for sale, if you could afford it. It's a research house testing a whole new design concept." He goes on to mention the indoor and outdoor gardens, the skylights, the steel columns and roof beams, and the sliding table with a built in cooktop. A article with many period photographs is available here. Original brochures for the house are available here. This Eichler was built in 1956, has three bedrooms, two baths, and is 1044 square feet. The X-100 is one of twelve homes that Inertia was able to visit in May on the Eichler Home Tour 2017. Earlier, we wrote about other houses on the tour, as well as posted a gallery of Eichlers that weren't included in the tour. Of all the Eichlers we visited, this one felt the most livable and down to earth. The spaces felt comfortable, bright, and well sized. Some were humbly furnished with IKEA, an inexpensive but nonetheless modern choice that many of us can relate to. While this house does look like an effortless tidying of an original Eichler, the renovations were extensive. The house started with a walled off kitchen separating the living and dining rooms, and had over the years been fitted with arches, crown mouldings and a large drop-in tub in the ensuite. This down-to-the-stud renovation saw the dining room moved to the centre of the plan, the kitchen to the front, and a sitting area added on adjacent to the kitchen (so the TV didn't have to go above the fireplace). The tub was removed and replaced with a large walk-in shower that has a floor-to-ceiling view of the re-landscaped back yard. Clerestory windows bring south light right into the main living space, and skylights in the bedroom wing add sparkle to what would otherwise be dark internal spaces. Unexpected splashes of colour contrast against the otherwise white interior. Even the side yard is activated as a comfortable and usable space. This Eichler was built in 1957, has four bedrooms, two baths, and is 2000 square feet. 1704 Yorkton is one of twelve homes that Inertia was able to visit in May on the Eichler Home Tour 2017. Earlier, we wrote about other houses on the tour, as well as posted a gallery of Eichlers that weren't included in the tour. While the San Mateo Highlands are indeed on a hill, most of the properties do not have a view. Their yards tend to be enclosed and feel very private. It's remarkable how much a yard can feel like an outdoor room when the eave of the house isn't much higher that the top of the neighbour's fence. The house at 2227 Cobble Hill, however, has an amazing view of the California countryside. As well, the yard is a little larger than most, given the rear living space an expansiveness uncommon in the community. It's southern exposure brings light deep into the plan. Skylights in eaves further bring light in. The large planes of glass, both the front and rear of the house, blur the difference between interior and exterior. The living room addition on the rear of the house has a high ceiling that clears and preserves the original roofline. The clearing out the crown mouldings and shag carpet, the rest of the renovations have restored the essential intent of this midcentury home. This Eichler has four bedrooms, two baths, and is 2158 square feet. 2227 Cobble Hill is one of twelve homes that Inertia was able to visit in May on the Eichler Home Tour 2017. Earlier, we wrote about other houses on the tour, as well as posted a gallery of Eichlers that weren't included in the tour. While many of the houses we saw on this tour were immaculately showable, this house was only partway through it's renovation. While the unrenovated parts of the house were closed off (the bedrooms and bathrooms), the rest of the house looked fantastic. 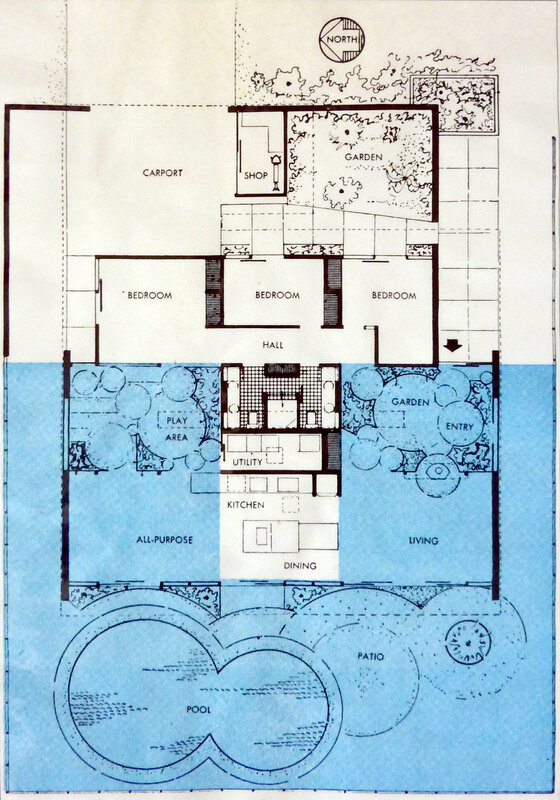 This Eichler is considered a 'true atrium' model. Rather than having a skylit forecourt, this house surrounds it's interior courtyard that is almost entirely open to the sky. It also serves as the entry to the home as the front door opens directly into the atrium. Windows face the atrium from three sides (there are no windows in the garage wall) meaning that someone sitting in the front office can see clear through the courtyard and the kitchen into the back yard. Recent renovations include taking down the wall between the kitchen and the entry to open up the space, and updating the kitchen with a large island and new cabinets. We had a great conversation with the owner who seemed very happy to be showing off the work he's put into his home. He did tell us a secret: his own furniture was hidden in the bedrooms and the rooms he was showing were staged by the San Mateo location of Scandinavian Designs, an American retailer of contemporary furniture. This Eichler was built in 1958, has four bedrooms, two baths, and is 1710 square feet. 2090 New Brunswick is one of twelve homes that Inertia was able to visit in May on the Eichler Home Tour 2017. Earlier, we wrote about another house on the tour, as well as posted a gallery of Eichlers that weren't included in the tour. Owners of Eichler houses have to decide if they are going to renovate or restore the building, or some combination of the two. In the case of 1755 Lexington Avenue, the owners were able to find a mostly original home that required some work to return it to the original aesthetic. Happily, the cinderblock fireplace and much of the mahogany panelling and was intact. The flooring, roofing and landscaping, however, needed replacement. The end result is very much in the spirit of Eichler. This Eichler was built in 1956, has four bedrooms, two baths, and is 1730 square feet. 1755 Lexington is one of twelve homes that Inertia was able to visit earlier this month on the Eichler Home Tour 2017. We posted a gallery of Eichlers that were not on the tour in an earlier blog post.